The Situation in the Great Lakes Region of Africa is still in Flux. There are Two Pieces of Legislation that have been Introduced in the US Congress that will attempt to Address this Issue. I have written about the Congo Conflict Minerals Act in other Mediums. This Article will Address the Growing Call regarding the LRA and the Calls for US Intervention in the Niger Delta. First of all is HR 2478. The Lord's Resistance Army and Northern Uganda Recovery Act of 2009. This Piece of Legislations deals with what is Currently the Longest Ongoing Insurgency in Africa. The LRA initially took up Arms against the Ugandan Military back in 1986. In Late 2008 it appeared that a Peace Deal was going to be signed between the LRA and the Government of President Museveni. At the Last Minute the LRA walked away from the Peace Deal. In response the Government of Uganda along with the Congolese Government and the Authorities of Southern Sudan launched Operation Lightning Thunder. AFRICOM (United States African Command) Provided Key Logistical Support for this Operation which is widely held to be a Failure. Activist Groups and Church Leaders from the Region have called for a New and Improved Lightning Thunder to be Launched with US Support. HR 2478 creates an apparatus where the US Government will develop a comprehensive strategy to Protect Civilians from the activities of the LRA and will Authorize Funds for Critical Needs such as Humanitarian Relief, Reconstruction and Transitional Justice. These are Critical Needs for the Restoration of Stability in not only Northern Uganda but the Region as a Whole. 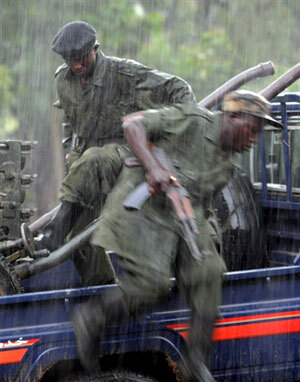 Militants are a Problem in both the Great Lakes Region and in West Africa. It is now time to Shift Focus to the Gulf of Guinea region of Africa. Or to be more specific Nigeria. An Estimated 28% of the Oil Imported by the United States comes from this Region. Nigeria is a Key Ally of the United States as well. But there is a Problem that Needs to be addressed. Nigeria has a Problem with Oil. The Niger Delta region where the Oil is produced is the poorest area of the Country. There is Massive Amounts of Economic Damages as well. An Insurgency has root due to the Unwillingness of the Nigerian Federal Government to Meet their Grievances. As a result the Insurgents use Sabatoge and Kidnappings to raise awareness to their plights. They have even asked the United States to Mediate their Dispute with Abuja. Currently Shell is in a New York Courtroom in a case that has been delayed on more than one occasion for creating Environmental Damages in the Region and Complicity in Human Rights Violations. Shell is facing charges that are made possible under the Alien Tort Claims Act which dates back to the Adams Administration. In another interesting twist Senator Feingold the Chairman of the Senate Foreign Affairs Committee African Sub-Committee has called for the Obama Administration to Intervene. What exactly the US can do beyond Mediation is not easy to determine however. President Obama will Meet with Nigerian Democracy Activists when He visits Ghana on July 11th. This could be a Fact Finding Mission by the White House to Determine what Strategy that the US could take in this Situation. The Situations in both Uganda and Nigeria cannot be Ignored.